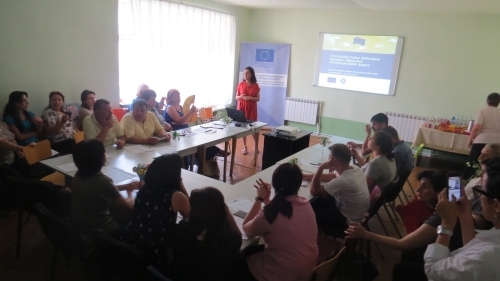 Armenia (August 2018) — International development organisation, Near East Foundation UK (NEF) and the Women’s Development Resource Centre Foundation (WDRCF) are implementing a project co-funded by the European Union entitled EU4Women: Economic Empowerment through Social Enterprise. 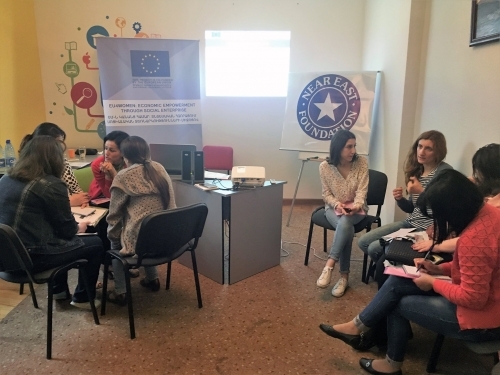 The project aims to strengthen sustainability and increase resources of Armenian civil society organisations (CSOs) involved in advocacy work and programs on gender equality and women’s economic empowerment. In early 2018, business model innovation trainings began with the goal of helping a group of Armenian CSOs rethink their operational and finance models around a clear mission to introduce new financing approaches such as private sector funding, crowdfunding, and establishing social enterprises. The ultimate goal is for CSOs to realign their resources, processes and revenue formula, and proactively navigate trends that will ensure their future in delivering women’s economic empowerment programs in their communities. The next step for Nvard and other participants will be targeted coaching paired with a small grants averaging EUR 1,500 for each participant CSO to begin implementing their strategies. The project will also incorporate a series of roundtables bringing together CSO’s and private sector actors to explore opportunities for collaboration and produce plans for joint actions. Results from these business model innovation activities will be replicated through regional mentorship circles, which will incorporate a range of CSOs and private sector actors to enhance sustainability and replication of these efforts. Ultimately, the project builds on the capacity of twelve civil society organisations to develop business plans and capitalize on co-financing support. At least six hundred women will benefit from the improved abilities of the CSOs, which include economic empowerment programs and advocacy campaigns to advance economic rights and equality for women. A portion of these women will benefit from direct involvement with the social enterprises once they are established. A second round of training and coaching will focus on social entrepreneurship as a financing approach and will serve to guide CSOs through market research and developing business plans. CSOs with viable plans will receive a grant, averaging EUR 20,000 (USD 23,252), to launch social enterprises with continued coaching and mentoring from NEF and WDRCF. CSOs social enterprises will have the opportunity to participate in market fairs while receiving marketing support. Additionally, NEF aims to develop a microfranchising model involving social enterprises as franchisees. Near East Foundation UK is an international development organisation that works to build inclusive, prosperous, and sustainable societies in the Caucuses, Middles East, and Africa by providing vulnerable and disenfranchised people with the skills, training, and resources to fully engage and prosper in their own communities and economies. NEF field staff, all from the countries in which they work, partner with local organisations to find grassroots solutions to development challenges (www.neareast.org/uk). 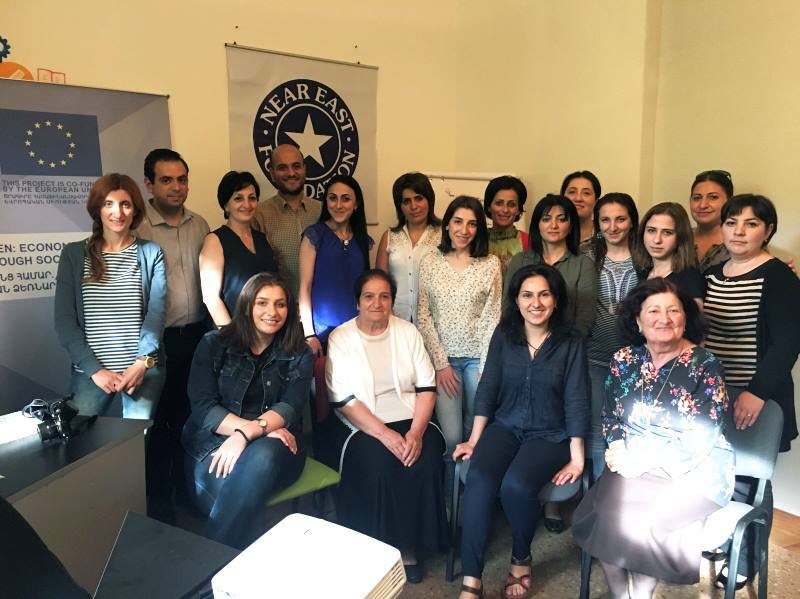 WDRCF is a Goris-based organisation that empowers the women of southern Armenia in their political, economic, and social lives. Being established in Southern Armenia, WDRCF enlarges its activities throughout Armenia, strengthening international and networks.